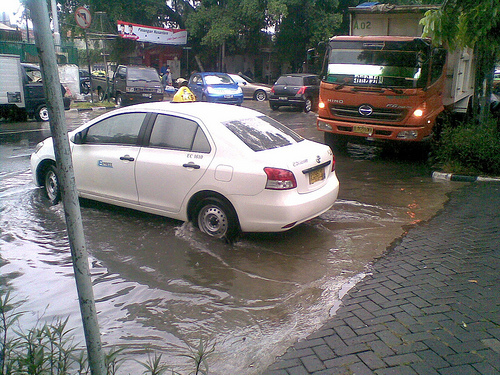 I am in Jakarta now for a few days and experienced heavy rains here for the first time. Of course it rained often in Medan where I have been living, but the drainage system seems to work well there. Not so in Jakarta. I was using the free wifi in a hotel restaurant and when I thought the rain had subsided, I tried making a quick dash back to my hotel in backpacker ghetto of Jalan Jaksa. The street looked more like a river. The footpaths along the street are narrow and usually have cars and bikes parked on them and there are also plenty of food carts, making it difficult to make your way down the street. The water of course is brown and I didn’t like not being able to see what might lie in that murky water. Fortunately I made it back to my hotel without dropping my laptop or falling in a hole. Always love and pray for Indonesia.